One of the best heritage hotels in Jaipur, Hari Mahal Palace is located 15 km from the nearest airport, 1.5 km from the closest railway station, and 2 km from the bus stand. Sprawling over 2 acres of lush gardens, the hotel is conveniently located close to the heart of the city. 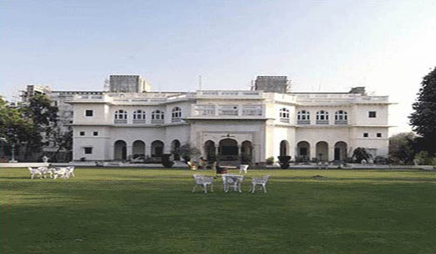 Originally, the palace was built by the descendents of Maharaja Prithvi Raj of Amber in the year 1930. If you are a food freak, then the multicuisine restaurant at Hari Mahal Palace in Jaipur is a gourmet's paradise. Served with utmost hospitality, the lip smacking delicacies from Continental and Indian cuisine that are on offer would surely make you crave for more. The hotel allows you to meet your business needs at the spacious Business Center, equipped with modern services like fax, internet access, etc. Hari Mahal Palace also provides excellent banquet facilities, as you can throw lavish parties and receptions here. Theme Lunches and Dinners, and performance by local musicians can be arranged on request.